It allows me to be the voice and advocate for those that don’t have a voice. On a recent afternoon, Jamilla Pinder was rearranging the items on her desk to make room in her office for visitors. Amidst her flow charts and office supplies and info graphic posterboards, she came across a note with some information she needed for the next item on her to-do list: finding out how to get a pair of replacement glasses for one of the victims of the April 15 tornado that ripped through east Greensboro. This isn’t her job, exactly. But it’s an example of the kind of thing Jamilla’s done throughout her career. Find something or someone in need, and figure out how to help. 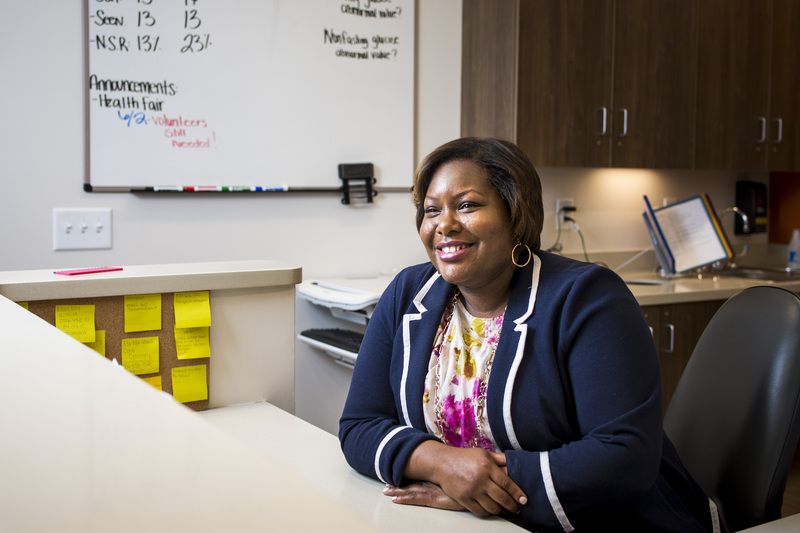 Jamilla, a Community Care Program Manager at Cone Health, has worked her way through the health system for 20 years. She started right out of high school, as a young mother working the third shift checking patients into the emergency room while studying agricultural economics at NC A&T. 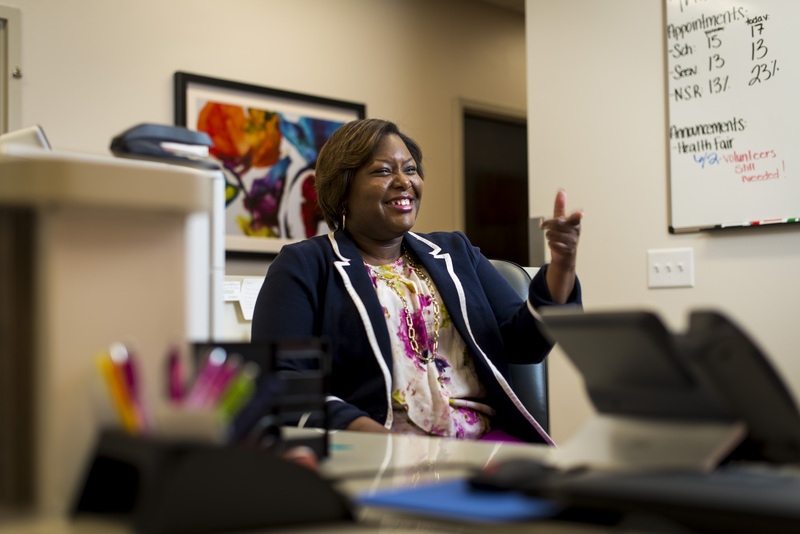 She learned the inner workings of the hospital and soon parlayed the gig into a full-time job with HealthServe Community Health Clinic, which provided medical services to thousands of uninsured and low-income residents. It’s where she says she fell in love with serving. She helped improved services at the clinic, reducing the patient wait times from 40-plus days down to same-day service. She started volunteering in the community, at Greensboro Urban Ministries and the Women’s Resource Center. She did visitor intake, taught self-esteem classes, mentored women getting back into the work force, and helped connect people in need with local resources. She’s still volunteering at the WRC 12 years later. 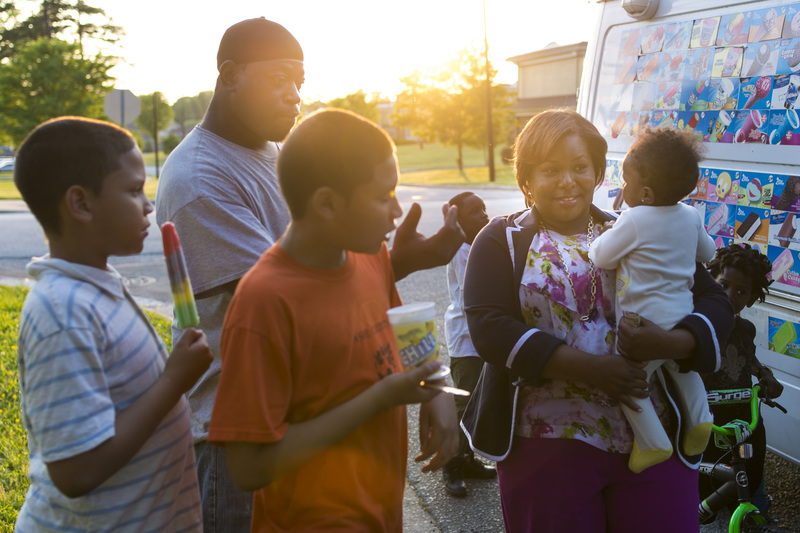 After HealthServe closed, she worked for Cone Urgent Care to create the Adult Care Center to help cover the needs of 8,000 to 10,000 people — the uninsured and underinsured – who were left without a primary care provider. “This is not just a job these are people’s lives. We are dealing with the most vulnerable of the vulnerable. You can’t be that I am coming to clock in and get a check and leave. You’ve got to be compassionate,” she says. 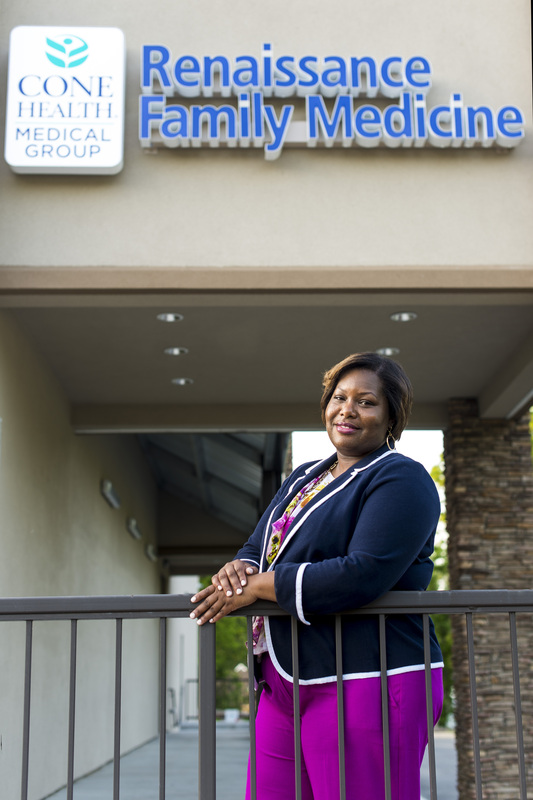 Jamilla’s latest project is the Renaissance Family Medicine, a Cone Health clinic that opened up in February on Phillips Avenue. It provides primary care services to adults and children 12 years and older in northeast Greensboro. Prior to opening the facility, she spent about 6 months in the community, attending neighborhood association meetings, talking to residents about their healthcare needs. The neighborhood was a healthcare desert. “Right now we are working on building awareness, letting people know we are here. We have one provider, one CNA and one registration supervisor seeing about see about 10 to 12 patients each day, offering primary care.” By summer 2018, they will have OBGYN services. She’s adapted to the community’s needs as they come – including doing wellness checks for people in the wake of the April 15 tornado that ripped through the neighborhood. Jamilla also teaches once a week with Reading Connections and just finished up with Other Voices Class 25.